Mobile phone technology is at its peak nowadays. People are using mobile phones not only for communication but for entertainment and education as well. If we specifically talk about the Islam, there are hundreds of Islamic applications but they are not authenticated. 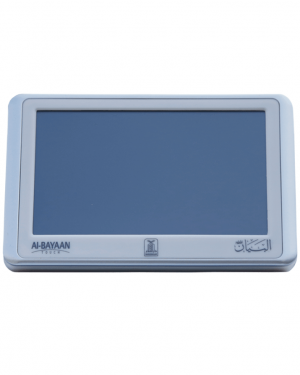 Moreover, we don`t have any dedicated and comprehensive Islamic gadget as of now. People who are using the Islamic applications are doubted about their authenticity and generally face the battery drainage issues. Darussalam Publishers is launching `Al-Bayaan` which is an Islamic content player with a full touchscreen and intuitive user interface. It is very useful for Quran learning, understanding and memorizing easily. 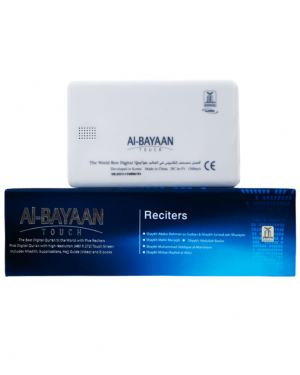 No matter your level of interaction with Noble Quran, you will benefit greatly from this amazing device. Simply by touching on any ayah, surah or page, it will start to read in a loud and clear sound. It Improves reading skills for all learners maintains the flow of reading as students and non-Arabic people encounter unfamiliar words. Use Al-Bayyan Tablet as your reading assistant anywhere, anytime. It has the audio recitation by world famous reciters like Al-Sudais, Al-Afasy, and Al-Maeqali, etc. Besides the Noble Quran, Al-Bayyan Tablet includes the following additional features so that this device can serve you batter and worth to carry with.